Our school and teacher programs offer a full range of experiences to spark creativity and critical thinking. They support the California State Content Standards in a variety of subject matter, for multiple grade levels, with emphasis in visual arts. 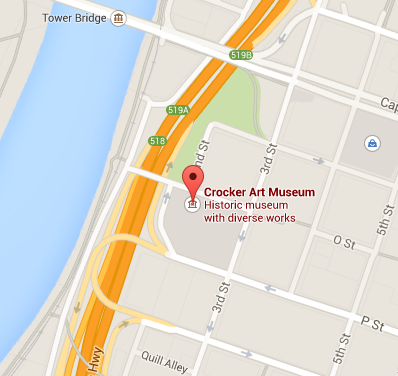 The Crocker offers Tours as well as Tour+ programs. We will also present fun and engaging art education experiences At Your School. And the Crocker offers Teacher Workshops where teachers can enjoy creative professional development. Scroll down for more information, or click here to find out which program is right for you. Guided Museum tours are led by trained docents and feature works from the permanent collection and special exhibitions on view. Led by trained docents and teaching artists, students explore works of art in the galleries and create their own works of art using media and techniques discussed during their tour. All art supplies are provided. Ignite the creative spark in your students, parents and educators during this fun, fair-like evening designed to build a positive and unified school community. Fun for all ages and artistic abilities. The Crocker's Art Ark, a mobile art education center designed for students in pre-K through 8th grades, brings original works of art and activities to schools throughout the region. Students learn about the Crocker’s permanent collection through an interactive, hands-on art project taught in the school classroom. Designed to bring high-quality art education experiences to 2 – 12 classrooms, particularly to those unable to tour the Museum. We welcome pre-service, current, and retired teachers to explore exhibitions, gain skills in discussing and making art, and acquire resources to support and extend classroom learning. Using a central theme and select works of art throughout the Museum, trained docents facilitate small-group discussions and hands-on activities.